Bowhunters have a lot to gain from top 3-D pros. 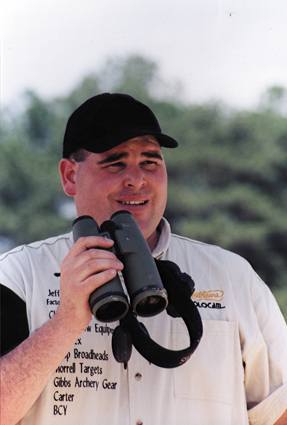 Jeff Hopkins is quite accustomed to "picking a spot" to aim his arrows...and then hitting it. A veteran, highly successful competitive shooter whose lifetime earnings range into the "truly incredible" bracket, Hopkins is quick to admit his tremendous success stems from a discipline that anyone can muster. "I work on my shooting form," he says, "and use that same form regardless if I am standing on a shooting line in Las Vegas, a shootingstake at a 3-D tournament, or in a treestand. Shooting the bow is the same. Only the targets are different." In comparing dot shooting with 3-D shooting, Hopkins says that you must consider each shot as a separate tournament. In Las Vegas, he says, you shoot 90 arrows. You have to shoot each one as if each was its own little tournament and that it was the only shot that mattered. He says the principle is the same on the 3-D range. He compares this to hunting by saying that most of the time the hunter will have only one shot opportunity. The only shot that matters is the one you are about to take! 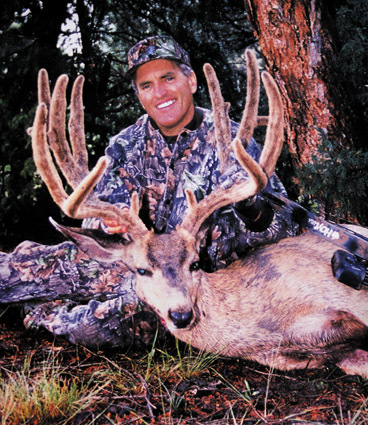 "The reason I got into 3-D was that I love shooting my bow and being outdoors. While many states have 90-day archery hunting seasons, most people are fortunate if the are able to hunt 15 or 20 of those days. For me, 3-D is an extension of the hunting season, giving me an opportunity to tinker with my equipment and sharpen my shooting skills." Hopkins compares shooting in tournaments...whether a local shoot with a group of friends or a national event with thousands of dollars at stake...to hunting. He says the pressure in each case is similar to having a big buck walk under your treestand. It is an important element in his being prepared for the hunting season. "People ask me all the time why they should go to a 3-D tournament. The benefits are so great and the time spent is so important, I simply can''t imagine why anyone who bowhunts wouldn''t go." 1. Archery is a discipline; that is, it is an exercise in mental control as well as physical. 2. Target and field archery trains the archer to aim at the "middle" of the...Middle...not just scoring a hit. 3. Shooting the longer distances trains the archer to hold steady and aim more accurately, even if shots at game are not attempted at the longer ranges. 4. National organizations, such as the National Field Archery Association, offer technical training on equipment and shooting skills through a series of courses. 5. Bowhunters can benefit from the experience of fellow archers by participating in field and target events. Hopkins believes one of the most important tools an archer can use is a good pair of binoculars. Binoculars are important in the woods because they allow you to see things much more clearly in dim light. You can see things you cannot see with the naked eye. With binoculars you can pick out deer standing in the shadows, or see more clearly the rack on the buck coming your way. Binoculars are invaluable in the woods, on the 3-D course or while shooting spots indoors. Right behind the binoculars in order of importance is a good rangefinder. "Once I''m in my stand, I range the trees around me. That way, when a deer comes in, I''m not guessing how close it is. I know exactly what the distance is. A good rangefinder is worth its weight in gold." Veteran competitor Jack Wallace II tries out all of his equipment well before the season. "Don''t wait until the last few days or you might find yourself with more to do than you have time for. As an example, don''t buy a new treestand and take it out to the woods that day without knowing exactly how it works, what makes noise on it, and what needs padded or needs moleskin applied. Being in a rush can actually end up costing you a lot more time in the long run, or even cost you your opportunity at a good animal. "Never consider your bow and arrow setup ''good enough.'' I often hear bowhunters say, ''It shoots good enough to kill a deer.'' There is no such thing as good enough. Your equipment is either right or wrong. No in-between. Work with your bow, arrow, and broadhead combination until you know the arrows fly well, group consistently, and that your bow setup shoots as well as you are capable of making it. You owe it to the game you hunt to make sure you and your equipment are the best they can be. "Check your bow and arrow setup frequently throughout the season to make sure the bow still seems to fit well and shoot as accurately as it did in the preseason. Sometimes archers will set their bow up in the summer when It''s warm and they have thin clothing on. Then, months later when it is cold, you may find that all of the extra layers of clothing now make the bow feel too long in draw length thereby not allowing you freedom for draw or the extra clothes may get in the way of the bowstring during the shot. Don''t let missing an animal be your wake-up call. Check your bow periodically and vary it slightly if need be to keep up with changing weather as the year progresses. 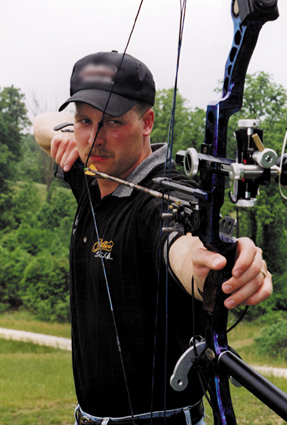 Champion archer and highly successful bowhunter Randy Ulmer knows accuracy is king on the range or in the field. "Many archers aren''t getting the accuracy they should from their equipment. Their common lament is, ''I used to be able to shoot tighter groups. Now I have this super-fast bow and I can''t hit anything with it.'' Fast bows are great. But, for every bit of speed you gain, you sacrifice forgiveness. If you have perfect form, forgiveness doesn''t matter. Unfortunately, most of us don''t have flawless form. "Three things make a compound bow faster: Low brace height, radical cams, and short axle-to-axle length. Each of the qualities that make a bow faster, however, also make a bow inherently less forgiving. Sure, you want the speed, but you probably can''t afford the reduction in accuracy. The best bow for each of us is determined by our form, our ability to judge yardage, and the bow''s intended use. Before you make a decision on which bow to buy, look at your strong points and your weaknesses. Only after an objective analysis of your abilities can you confidently select the bow that''s right for you." Ulmer offers some sage advice to more accuracy on the range and in the field. "Pick a spot. You should always know precisely where you will be aiming and what you will be using as an aiming reference before you draw back on a 3-D target. Large or bright objects (nocks) are best. Small or ill-defined shadows are often lost when you are at full draw. "Number your hunting arrows. When I began shooting competitive archery, I was introduced to the idea of numbering my shafts. When hunting season rolled around, I tuned and grouped my hunting arrows quickly, not bothering to number them. My groups were never that impressive—not nearly as good as the groups I shot with my competition setup. "As I became more ''tune conscious'' I vowed to make my hunting setup as accurate as my target setup. I numbered my arrows and made an important discovery. My groups still weren''t that impressive, however, each individual arrow hit in nearly the same spot every time. Some unidentifiable characteristic of each broadhead/arrow combination caused it to fly differently (I have always aligned my broadhead to the shaft so I didn’t think that was the problem). "I experimented with different broadheads and found that the higher-quality broadheads had tighter tolerances and grouped better. I now make a dozen hunting arrows, number them, align them and group them. Most will hit in the group, though I still get a few flyers. If rotating the nock or replacing the broadhead does not bring the arrow into the group, I remove the broadhead, replace it with a field point, and use that arrow for practice."